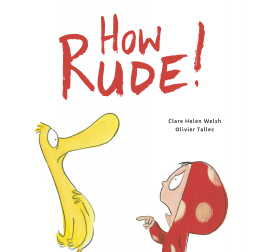 An amusing way for young children to learn manners: How Rude! – Joyce's mystery and fiction book reviews with some non-fiction too! An amusing way for young children to learn manners: How Rude! This is an appealing and funny way to help young children learn the importance of good manners. In this humorously illustrated story, Dot and Duck have a visit. The two are going to have tea together but Duck is never satisfied and behaves quite poorly. Dot’s refrain throughout is “How rude!” Things get worse and worse, the mess gets messier, the phrase how rude is printed larger and larger… and so it goes. Finally Dot has her own moment. By the end of the book all comes together and both Dot and Duck have shown their better selves. The story resolves in a way that will entertain young children. Thanks to NetGalley and the publisher for this likeable read. The opinions expressed are my own.